"Our unique armoire was inspired by old cupboards that were originally used for food storage, but this piece was actually designed for use in a modern bedroom. The piece has ample storage for clothing. 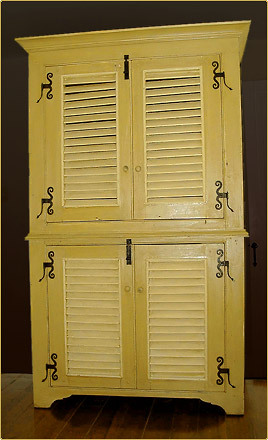 We incorporated original, antique louvered doors and hand-wrought staghorn hinges and finished the piece with a two tone, milk paint finish. Other cabinets similar to this design have uses as entertainment cabinets or kitchen storage."